This 1988 43' San Remo is a one of a kind vessel. Owner is very meticulous! Twin 7.4L inboards, Onan generator, new air conditioning, shore power, 2 staterooms and 2 heads. Well-cared for and well-maintained. New exterior paint, new carpet, engine room is very clean!! Too many new items to list! The interior is spacious and very clean. You won’t be disappointed with this motor yacht whether you want to cruise or live-a board! Turn key ready to cruise. This is a large, clean Motor Yacht for under 50K, don't miss this DEAL! DRASTICALLY REDUCED...OWNER WANTS THIS BEAUTIFUL BOAT SOLD!! Most forward is chain locker followed by stateroom with centerline queen size berth, vanity to starboard and hanging locker and private entry to head to port. Aft to starboard is "U" shaped galley and to port is head with shower and storage lockers. Three steps up to salon, curved sofas to either side and a bar/countertop. Three steps down to aft stateroom with portside queen size berth, folding vanity with lights and starboard side head with bathtub/shower. Four steps up from main salon to aft deck. Large flybridge with bench seating to either side and behind the helm. Step on board to a roomy aft deck, then a couple of steps up to the flybridge or down into the cabin. The salon is large and modern. Forward to starboard is a well-appointed galley and the forward to a guest stateroom with a huge bed, head, sink and shower to port. Aft of the salon is the master stateroom with an angled Island queen bed, makeup vanity, couch and en-suite head with a spa tub and shower. There is also a flat screen TV, stereo, hanging locker and storage. Our Wellcraft listing is a great opportunity to purchase a very nice 43' San Remo 43. 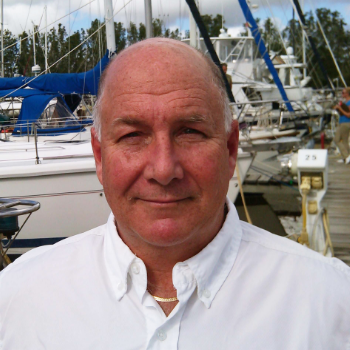 She is currently listed with United Yacht Sales broker Eddie Bauer who can answer all questions about the boat for you. Please don't hesitate to reach out to our team of professional yacht brokers to schedule a showing. There are many yachts listed for sale on the MLS each with a different history. We look forward to helping you complete your search for the perfect boat or yacht for sale.